Safety/Quality Approvals: CE, CQC, CCC, ROHS, SASO. Foshan City Nanhai District Xiqiao Pingao Electrical Appliances and Hardware Factory was established in 2005 as a professional manufacturing factory. 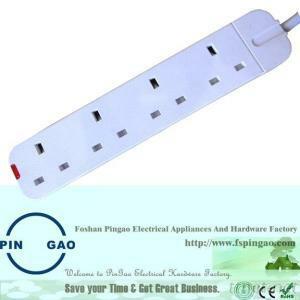 We have been in electrical appliances and hardware production for 6 years and are specialized in producing all kinds of electrical plugs, Extension sockets, Socket Adapter, Cable Reel, Electrical Wire and Lightings. With Superior Quality, Competitive Prices, First-Class Craftwork, Safe Package and Prompt Delivery, PinGao are happy to work together with you to service your market and develop each other. Apart from our own products, we also provide OEM services and accept customized orders as well. We have developed designs for our customers in Europe and the Middle East, and our products are popular in overseas markets.